'Madeleine Mitchell is not only a violinist of great virtuosity but also of a very special poetic quality..an independent pioneering figure, she brought her visionary imagination to the founding of her Red Violin festival. She succeeded in creating a unique series..a tremendous inspiration'. Madeleine Mitchell was recently described by the Chief Music Critic of The Times as 'one of Britain's liveliest musical forces' and by the Herald as 'a violinist in a million.. staggering virtuosity and unparalleled musicianship' after a recital in Glasgow. She has performed in over 40 countries as a soloist in a wide repertoire in major venues and frequently broadcasts for television and radio including the BBC Proms. A highly creative personality, she was short-listed for Woman of the Year 2006 and the European Women of Achievement Awards. Her latest CD 'Violin Songs' - popular short pieces for violin and piano with Andrew Ball and Elizabeth Watts soprano, winner of Cardiff Singer of the World Song Prize 2007, will be launched at the Red Violin. Her seminal recording with Joanna MacGregor of Messiaen's Quatuor pour la Fin du Temps is due for re-release and the violin solo movement has been reissued on 'Quiet Music' (SoundCircus). Her recording of Alwyn chamber music for Naxos is released July 2007. 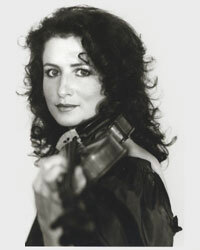 Madeleine Mitchell has performed concertos with major orchestras including the Czech and Polish Radio Symphony, Wurttemberg and Munich Chamber, the Royal Philharmonic and other London orchestras; Welsh Chamber Orchestra, Orchestra de Bahia, Brazil, Malaga Symphony of Spain and for the BBC. 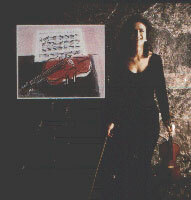 She directs concertos from the violin such as Bach and Vivaldi Seasons and commissioned a unique 'concerto' by Harvey, Pecou and Panufnik for violin and voices, premiered at Bath and Spitalfields festivals. She recently performed Lou Harrison Violin Concerto with Percussion Orchestra in Symphony Hall Birmingham International Series as part of her collaboration with Ensemble Bash - FiddleSticks, supported by ACE and records this and other works this year for release at the Red Violin festival. Madeleine Mitchell is well known for her recitals in a wide repertoire, frequently broadcast on BBC Radio 3 and television - often in Wales - and for her imaginative programming. She represented Britain in both the festival UKinNY with a recital at Lincoln Center and for the centenary of Entente Cordiale with France. She has given recitals at Sydney Opera House, Seoul Center for the Arts and Hong Kong - part of a 3 month world tour supported by the British Council, played at many international and most of the major British festivals and frequently performs in London. She was chosen by the legendary leader of the Amadeus Quartet, Norbert Brainin to play with him for his 80th birthday concert at Wigmore Hall. This year she will feature Elgar violin works in recitals in festivals in Cambridge, the Lake District, Hampstead & Highgate, St David's Hall Cardiff, St George's Bristol and the Malta International String Festival and the violin concerto in Dundee. Madeleine Mitchell was awarded the Tagore Gold Medal as Foundation Scholar at the Royal College of Music where she has been a Professor since 1994. As Fulbright/ITT Fellow she gained a master's degree in New York studying with DeLay, Weilerstein and Rosenberg at the Eastman and Juilliard schools. She gives master classes worldwide, is Director of the London Chamber Ensemble and is on the faculty of the Schlern International Festival, Italy in July.